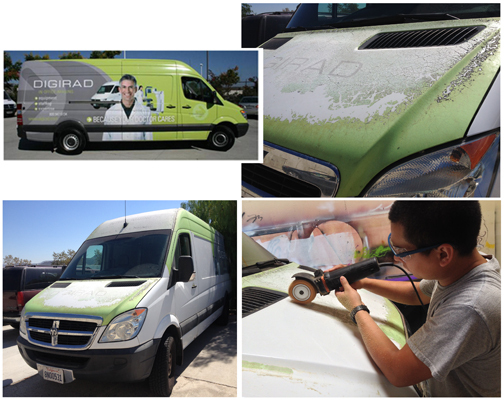 Vehicle wraps, truck wraps, van wraps are great temporary advertising tools. They last 3 to 5 years, will make you money, but don’t leave them on too long! This is a sprinter van that was brought to us to remove the wrap someone else had done 7 years earlier. It was left on about 2 years too long. Not only was it a bad reflection on the business, it cost them a lot more to remove it! We can give you and your business the impact your looking for to get the business you want, but we never lie about the limitations of the product and tell all our customers that 5 years is the longest amount of time they should leave a vehicle wrap on. Check out more info at our web site. A Brand New Van Wrap! 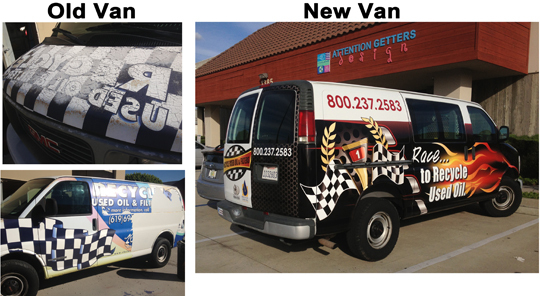 After taking more than 12 hours to remove the old vinyl and glue, we were able to redo the van wrap for the City of Chula Vista. It’s amazing that a vehicle that looked so bad a few days before, now looks fantastic, like a brand new van! Moral of the story is to always make sure your vehicle graphics are in good shape, clean, and not faded or pealing off. Your outdoor advertising on vehicles, banners, and signs are often the first impression people will have of your business and what services and/or products you provide. It doesn’t matter if it’s the sign on your building or simple lettering on your truck–if they look bad its time to redo them. First impressions matter!